What do you call a wireframe without visual form, universally applicable to any scenario, with power to move hearts and inspire action? Is it not simply our words? When put together to frame an idea, they can cut through ambiguity and shine on every business requirement the bright light of purpose. Every design should begin by writing. And every product should have a manifesto that captures what problem it is solving and how it intends to do it. 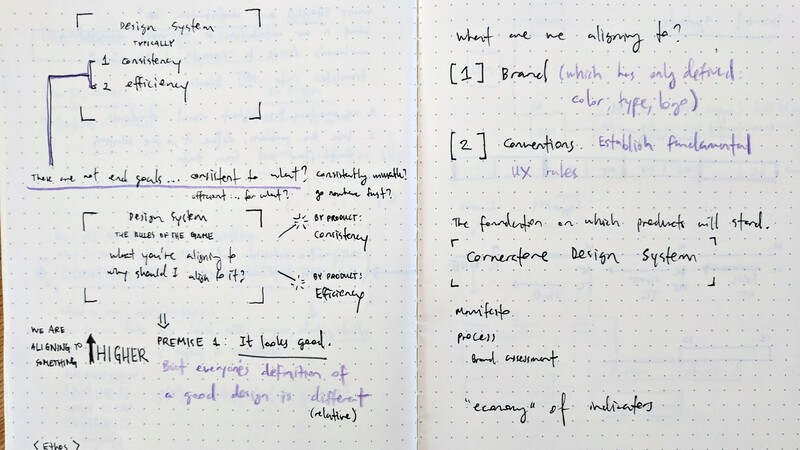 Here are a few excerpts from product manifestos I have written (client names hidden). People at our company have various administrative tasks and valuable content, often in great number and from various sources. Those who travel often are not always at a desk and need a mobile solution to verify and complete them on the go. “Start Your Day” is a lightweight mobile application that provides a quick readout of a users’s required administrative tasks and content of interest to them, preparing them to begin their day with clarity and uncluttered focus on the day’s activities. The Cornerstone Design System (CDS) seeks to establish a baseline standard for user-friendly internal applications at our company. We believe that this foundation will elevate the quality of UX, creating a more trustworthy, employee-focused organization. One Brand: CDS seeks to unify the internal product landscape around the guidelines and principles of the corporate brand. Focus on the Basics: Our focus is first on establishing sound fundamentals of interactive design. Be Helpful and Enable Others: CDS does not exist to force arbitrary compliance requirements. It is designed to be helpful. Our desire is to enable business teams to incorporate user-centric thinking and design into their process.